The social media sphere began buzzing early as world championship fans prepared for game four. 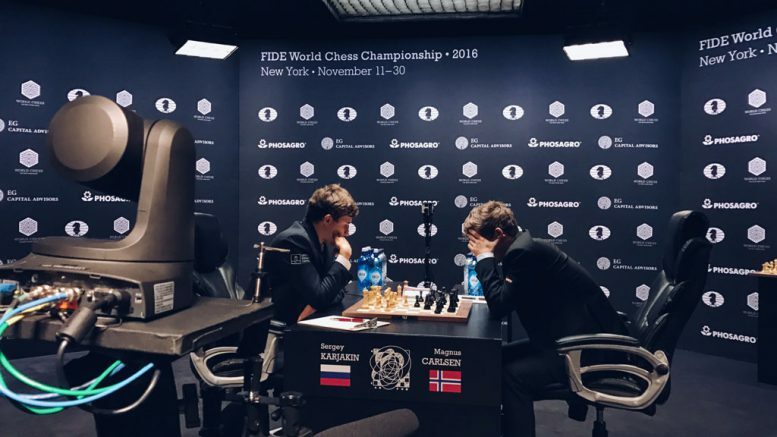 The previous encounter ended with honors divided after a ferocious and dramatic battle, thanks to an incredible defensive performance by challenger Sergey Karjakin. Despite the very genuine excitement generated by game three, the game itself was something of an acquired taste, with an apparently tranquil extended endgame transformed into a furious boxing match thanks to a series of subtle unforced errors. For Tuesday’s clash, there were plenty of predictions, and maybe also a dash of wishful thinking. Looking forward to tonight's game I forecast another Ruy Lopez and possibly even a Berlin. @bennedik No. I think that we will see a relatively short draw today. Players don't get game three out of their system that easily. This little conversation referenced the lack of queens on the board that had characterized the match so far, and a fairly traditional prognosis in reply. But these are shorter matches, and the combatants are younger men. On Chessbase.com a poll showed that Karjakin was the heavy favorite in game four according to voters, doubtless swayed by his incredible tenacity the day before, and the advantage of the white pieces today. According to my crystal ball, Magnus would likely try to push safely and doggedly again, trying to capitalize on his stamina and experience, but that a tame day was something that Karjakin could achieve if he wanted. 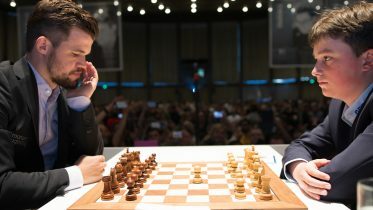 The opening of game four briefly followed the path of game two, before the Russian challenger chose to see what his adversary had planned in the most common lines. On move 7 Magnus hinted he was ready to play the sharp Marshall Gambit. Once again Karjakin backed down, and steered play into quieter, less ‘booked’ channels. This trend baffled some onlookers, and the feinting in the openings so far has contradicted conventional wisdom. Magnus has abandoned his dear ‘Berlin Wall’, the defence where an early exchange of queens allows him to achieve his usual goal of avoiding dangerous hostile computer preparation and steering play into the subtleties that he handles perhaps even better than modern machines. Instead he has chosen to risk sharper battles in variations more likely to contain the prepared, hidden mines that opening theoretician Karjakin and his supposedly immense support team are armed with. A fairly standard position type arose, with everything to play for, and chances for both sides. 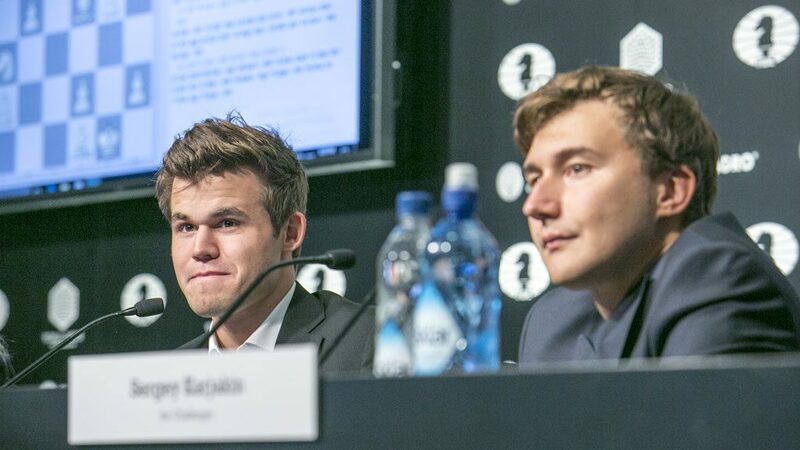 In the post-game press conference Carlsen claimed that he forgot what he was supposed to play relatively quickly in the opening, but that ‘it worked out’. Karjakin explained that he had missed Carlsen’s 18th move, distracted by some attractive variations that worked out well for him. After this miscue, he made things worse and seemed to be stumbling towards inevitable technical defeat. Can't understand some experts who claiming that Magnus is out of form.He is slow starter but playing better now than in Chennai and Sochi. 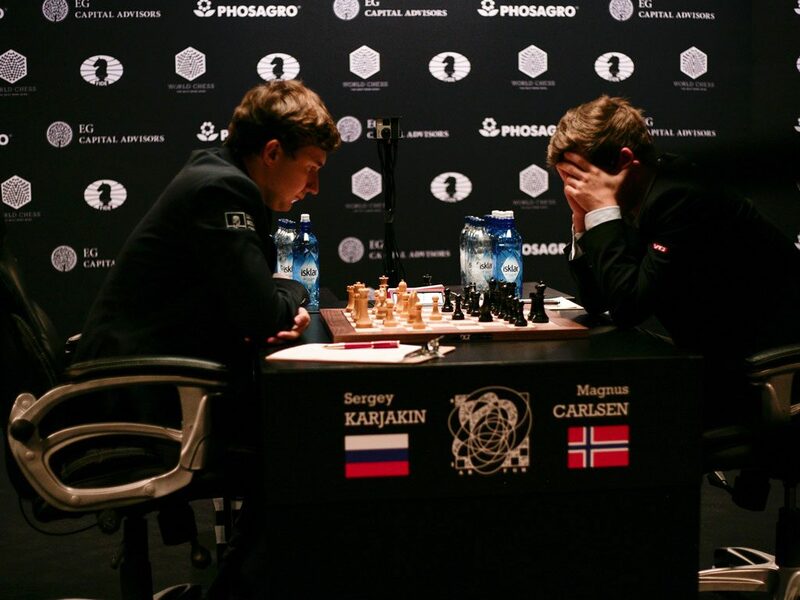 Pavel Eljanov is a former Carlsen second, and a world elite player, so this is an informed opinion – though it was perhaps revised after the eventual technical oversight that allowed Karjakin a lifeline later. It does raise an often repeated point though, that I haven’t heard discussed in a match context: Magnus is notoriously ‘slow to start’ – but here he has been – mostly – crisp, energetic and frightening. The errors that have crept in have come from a position of total safety and superiority, frustratingly near victory. And daily suffering is no way to run a title challenge. @GMjtis A million bucks vs. The Dane and Magic Magnus. No contest. After 36 moves Svidler was moved to describe the fight back as white’s best position since his error on move 19. «You can imagine him holding this,» Peter said. But the pressure of defence and the clock elicited a surprising and committal decision for white’s 37th. Sergey’s manager Kyrillos Zingalis is pessimistic as they head for move 40 – he doesn’t believe one can escape this kind of battering from the world champion two days in a row. Magnus’s declared strategy of ‘keep hitting until they drop’ usually works faster than this. Maybe people wouldn't think these Carlsen squeezes were boring if he had a cool nickname like "The Tønsberg Strangler" or something. 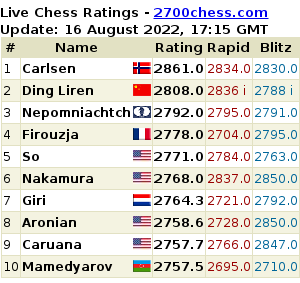 After the time control on move 40, engines were making Carlsen fans pessimistic, but Peter Svidler told his listeners at chess24.com not to be swayed. He assessed the position as borderline winning, and extremely difficult to hold in practical play. Which meant that we had a repeat situation from the day before – a delicate duel between the world’s best technique and arguably the most stubborn defender in the business. But once again Karjakin refused to give up, and did his mirror version of Carlsen. While the world champion specializes in finding a nearly invisible series of moves that create and maintain tension and chances in a position, the challenger seems to be able to do the same thing in defence – consistently find hidden ways to resist and make a winning process infuriatingly difficult. The critical moment in game four came when he played 43. g4. Carlsen had a choice to make, and after only about five minutes, his decision triggered a wave of confusion through the ranks of watching experts. By closing the position, he refused to create the coveted second front and instead offered hope for the erection of a white fortress. Commentator Peter Svidler could not see Carlsen’s winning plan, and tried assuming that the champion’s legendary endgame judgement must mean a solution was there. But as computer engines began to spin in place, claiming a huge edge for black but finding no way to improve his position, Magnus slowed down in frustration and Sergey began to move quickly and visibly relax. If there was a winning plan, it was becoming clear that no one and nothing could see it. Magnus stubbornly tried to conjure up something, but agreed peace just short of 100 moves. The post game press conference and interviews produced some answers. Magnus admitted that he had failed to consider the possibility of a drawing fortress, but seemed surprisingly unaffected by another missed opportunity, still managing smiles and jokes with the press. He repeatedly praised his opponent’s resilience, and refused to dwell on the disappointment, preferring to look ahead. Several times he expressed his conviction that being on the attack rather than defence was what counted in such games. Having seen the champion annoyed by underachieving in the past, I must confess to being surprised by just how positive his implacability has been after this pair of games. After game 3 former FIDE world champion, Ukrainian GM Ruslan Ponomariov, had tweeted his opinion – or advice – to his former compatriot. In fact, Karjakin, at the tender age of 12(!) had assisted Ponomariov in the latter’s world title run, and even though Sergey has turned his back on the country of his birth, there must still be bonds there. If @SergeyKaryakin wants to win, he should take opponent out his comfort zone. Many draws don't mean that @MagnusCarlsen will lose himself. This seemed to be very reasonable advice before the drama of game four. A match of boring draws might not undo the champion, but might a series of miraculous escapes by the challenger shake Carlsen psychologically? Such a scenario raises the specter of how another undisputed world champion came undone; Kasparov was surprisingly toppled in his day by Vladimir Kramnik, who proved to be perfectly designed for that particular job, if not as capable of dominating the game. He frustrated Kasparov at every turn, and never lost, taking the match by converting two of his own advantageous positions. One doesn’t always have to be the clearly better player, sometimes you just have to be your opponent’s nemesis. The match looks likely to become a duel of wills, between two extremely stubborn young men. Karjakin’s growing confidence must be a rather fragile type still – seeing how much punishment one can take is no recipe for winning a world title, and he simply must demonstrate that he can do more. Carlsen could be buoyed by the knowledge that he seems to be able to generate huge winning chances almost at will, and the terrifying Russian preparation machine has not made the slightest appearance. But there is still the danger that he will experience festering frustration at not having taken a lead. The battle of minds continues.